Get Outside! 6 Towns & 6 Scenic Hikes Near You! Vibrant colors add new beauty to Rice’s Landing in the fall! The days of summer may be winding down, but there’s still plenty of beauty to enjoy in western Pennsylvania and its communities! The cooling weather means that now is the perfect time to get outdoors – and the changing leaves will soon provide a glorious backdrop for hikers. No need to google for scenic hikes near you – we have a few ideas already! Elizabeth, PA. Located right in Allegheny County, the borough of Elizabeth sits 15 miles south of Pittsburgh. Elizabeth’s downtown area features great shopping and dining options – making it a great, affordable day trip destination! 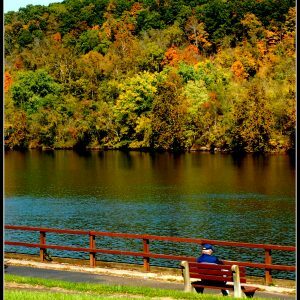 This fall, consider walking through this quiet town – you can enjoy the changing leaves and autumn weather as you stroll along the Monongahela River, which the town sits by. Elizabeth is also home to Round Hill Park – a 1,100-acre park with walking trails, picnic areas, and a working exhibit farm. Elizabeth’s quiet river walkways combined with these walking trails mean that you’ll get to enjoy some beautiful sights during a quieter day out and about. It all makes for the perfect day trip! Fredericktown, PA. In the summer this Washington County town is a great spot for paddling along scenic Ten Mile Creek. As the seasons change, however, hikers and cyclists will be able to enjoy the foliage along Greene River Trail! This beautiful 5.2 mile walking and bike trail runs alongside the Monongahela River, giving visitors a chance to explore what was once coal mining country. Today you’d never know about this industrious past, as the area is lush and green – although soon the trail will be lit with vibrant autumn colors instead! 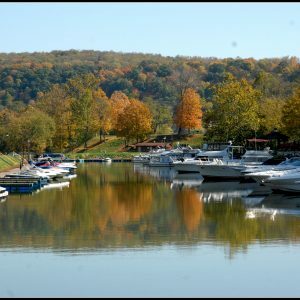 Like Elizabeth, very little travel is required if you visit this trail, making Fredericktown a fantastic day trip location for those on a tight budget. Rices Landing, PA. In addition to being rich in local history – including the travels of George Washington and coal barges – Rices Landing is a beautiful spot to watch the autumn settle in. The Greene River Trail that passes through Fredericktown also passes through Rices Landing. So depending on your interests, perhaps you’ll want to venture to Rices Landing to combine a little history with your day of hiking! 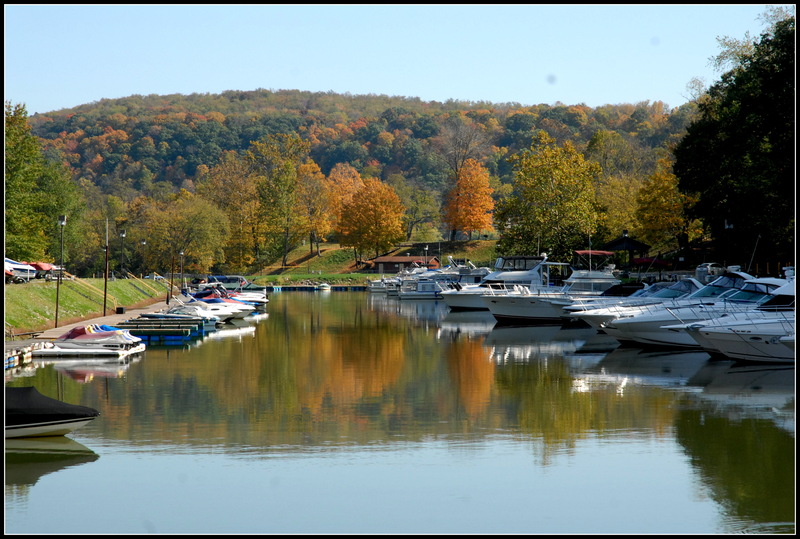 Fall foliage reflections are a must-see this season in Fredericktown. Greensboro, PA. Called “Delight” by the Mingo Indians who originally inhabited the area, Greensboro continues to live up to its name as it develops beautiful riverside trails and more for nature lovers to take advantage of. Drive to the area and you can explore the Greensboro Walking & Biking Trail – it stretches 1.25 miles along the Monongahela River, starting at Mon View Park. You can also step onto The Warrior Trail, which runs for 67 miles and follows ridge tops for most of its length. Despite its name, Warrior Trail offers one of the easiest hiking paths across Greene County, as well as some of the county’s most spectacular views! Not bad for a location that’s a mere hour and a half away from Pittsburgh! Fairmont, WV. 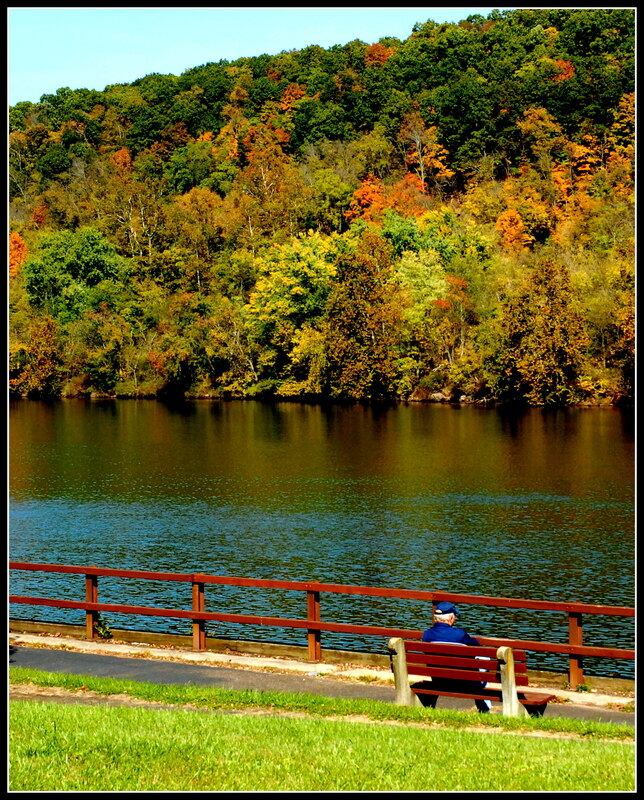 Interested in trekking out of Pennsylvania for your fall foliage tour? With a population of just over 18,000, the quiet and small West Virginia town of Fairmont is a fantastic seasonal getaway location. Fairmont is actually the home of the first Pepperoni Roll, and you can even visit the Country Club Bakery – the home of the first roll – before heading out on a hike! Fairmont is home to two rail trails, or railway tracks converted to paths and walkways. One trail, the West Fork River Trail, runs for 14.5 miles, providing beautiful scenic views of the river and surrounding foliage to bikers, hikers, and more (as the trail is wheelchair accessible). And if you’re looking for a shorter trek, the three mile long Marion County Trail (MCTrail) runs from the Mon River Trail South marker to Prickett’s Fort State Park and Morgantown Ave. This destination may be out-of-state, but it’s well worth the trip! Morgantown, WV. While better known for West Virginia University and “The Mountaineers,” Morgantown’s beautiful setting makes it a fantastic destination spot for fall foliage seekers. The town includes numerous options for hikers, including the trails of Coopers Rock State Forest. Visitors may also consider traveling the 6-mile paved Caperton Trail, which follows the Monongahela River and passes through several local parks. And if that’s not enough, the western endpoint of the Deckers Creek Trail is located in Hazel Ruby McQuain Riverfront Park, which Caperton Trail passes through. Start booking those hotels now, guys – you’ll thank yourself when you’re out on the trail of your choice! As you can see, western Pennsylvania and even neighboring West Virginia has a number of cool and scenic hikes to help you get out and about this season. You’ll absolutely want to travel to at least one of these towns. Don’t forget to take a moment to find out exactly what’s happening in these towns this fall, too! You can visit our website calendar anytime as you plan your great fall adventure.